Daily circulation is above 200,000 copies but as copies are often read by many people, the actual readership is much higher. It has a market share of almost 75%. The biggest competitor of the Daily Nation is The Standard, published by the Standard Group. It is a morning newspaper published seven days per week, available in all major cities in East Africa. The Sunday version is called the Sunday Daily. It’s offices are located at Kimathi Street in Nairobi. 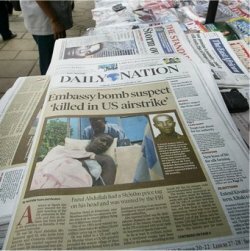 The Daily Nation also maintains an excellent website, which publishes many articles from the newspaper and has over 3 million daily page views. The website and it’s archive are accessible free of charge. The forerunner of the Daily Nation – the Swahili newspaper Taifa – was founded in 1959 by Michael Curtis and Charles Hayes, newspapermen in London and Nairobi, respectively. Reports that Karim Aga Khan IV founded the newspaper are incorrect. Instead he bought the Taifa newspaper for 10,000 British pounds a year after it’s founding, and renamed it Taifa Leo. The plan of the young Aga Khan, who would set up a whole range of NGO’s for humanitarian goals during his life, was to use the newspaper to create an African nationalist public opinion and end colonialism. In 1960 he launched English language editions of the Taifa Leo: the Daily Nation and Sunday Nation. When Kenyan independence was announced on December 12th, 1963, the Daily Nation’s headline was: “Kenya Free”. The newspapers later evolved into the Nation Media Group, a corporation which also owns the Sunday Nation newspaper, NTV (Nation TV, a television station), Nation FM (a radio station), the weekly newspaper The East African, the Business Daily newspaper, the Weekly Advertiser, and What’s On magazine. The Newspapers division of the Nation Media group alone has 470 full time employees and an annual turnover of 3 billion KSH (44.3 million USD). The Nation Media Group is quoted on the Nairobi Stock Exchange. The Aga Khan Fund for Economic Development, an agency of the AKDN, still owns the majority of the shares of the Nation Media Group. 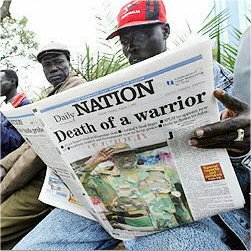 Although the Daily Nation continues to be important for the democratic development of Kenya, and is an inspiration to journalists throughout Africa, it has also been criticized because of how it treats it’s employees. In January 2007, the company fired 7 journalists only for being a member of the Kenya Union of Journalists, a union which campaigns for fair pay and good working conditions for journalists, and for freedom of the press.